AFC Ajax FROM Japan: Eredivisie- Ajax vs NEC / A New Tactics? 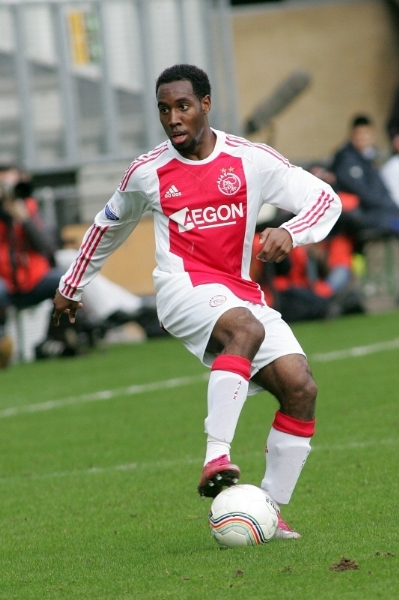 Last Sunday Ajax defeated NEC 4-1. Bulykin scored two, and was substituted after playing only 30 minutes (De Boer joked that he wanted to maintain Bulykin's goal per minute ratio). Siem de Jong especially did a good job, but in this article I want to focus on Anita's role. Anita can play both side back and defensive midfielder. In the match against NEC he played at defensive midfielder due to the injury of Enoh. Anita is below average in terms of bodily strength and defensive skills, but he has agility and stamina. Anita's contribution to defense was not something I want to mention today. In the last match, his role in ball possession was something you might not have seen recently. In Ajax, ball possession starts from the goalkeeper. When Vermeer holds the ball he always tries to make a short pass to defenders instead of making a pant kick to attackers. Usually, center back Vertonghen or Alderweireld receives the ball from Vermeer and makes a longitudinal pass to one of the midfielders, or Vermeer makes a pass directly to Enoh after two center backs vacate a space. But in the last match Anita tried to receive the ball in between Vertonghen and Alderweireld. By doing this, the two center backs, who both have good vision and good passing skills, can play a more active role in ball possession. When Anita received the ball near the defense line and made a pass to other players, he stepped back into the defense line and prepared to receive a return pass. Moreover, with Anita at a lower position when in possession, Eriksen played at a lower position, too, and built attacks from the rear of midfield. This was effective at least in the first half. In the second half they continued to do this, but in a more experimental way. In the middle of the second half, when they were trying to build attacks backward, their positions were 3-4-3. Vertonghen played as a sweeper or "libero", Alderweireld and one of the side backs (who was far from the ball) temporarily became right and left center backs. Anita played in front of Vertonghen, and the other side back, who was near the ball, played as a wing back. This kind of smooth position changes cannot usually be seen in dutch football, as most Dutch teams do not like to change their 4-3-3 formation. I had been thinking that Ajax were not the exception, but in the match against NEC I saw different Ajax. It is unclear whether this was a new tactics instructed by coach De Boer or just an accident, but anyway I felt that football played by Ajax in the last match was exciting. Tonight Ajax visit Old Trafford to play an Europa League match against Manchester United. Let's keep our fingers crossed!